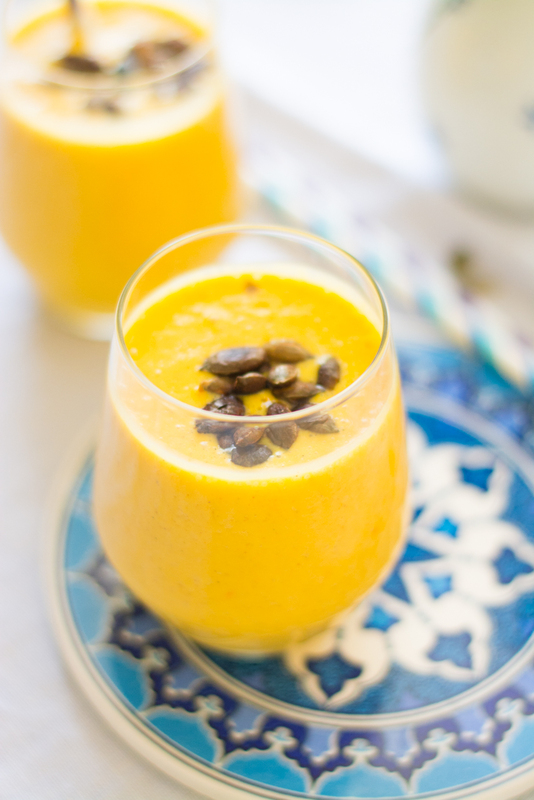 A lassi is a traditional, cooling Indian drink that can be either sweet, often mango flavoured, or salty. 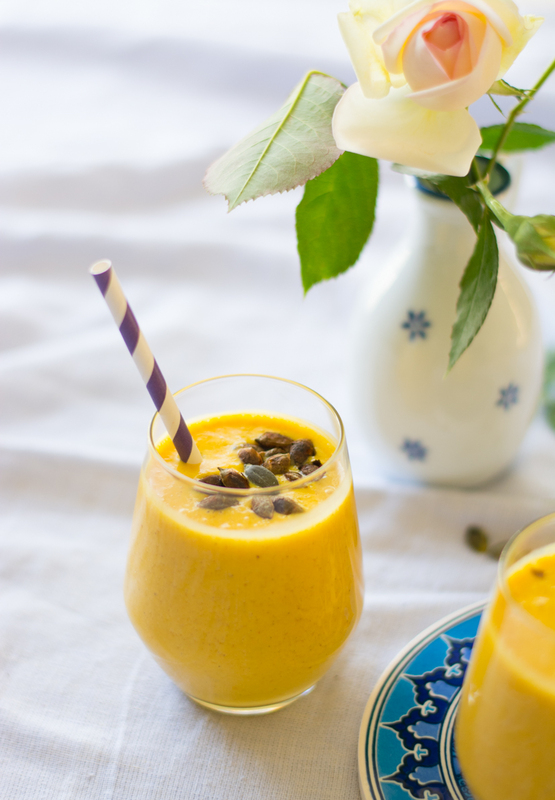 Many a restaurant has been guilty of serving a sweet mango lassi that is astoundingly, eyes squeezingly sweet. That level of sweetness usually overwhelms an excessive mango flavour that can’t possibly be natural. For me, the stifling sugariness of it drives me towards the salty option. Yet my thoughts drift to lightly sweetened home-made lassi using fresh fruit, such as this cherry lassi. When the good people of The Society asked me to come up with a Thanksgiving recipe, it was the perfect opportunity to create a drink combining pumpkin with Indian flavours. 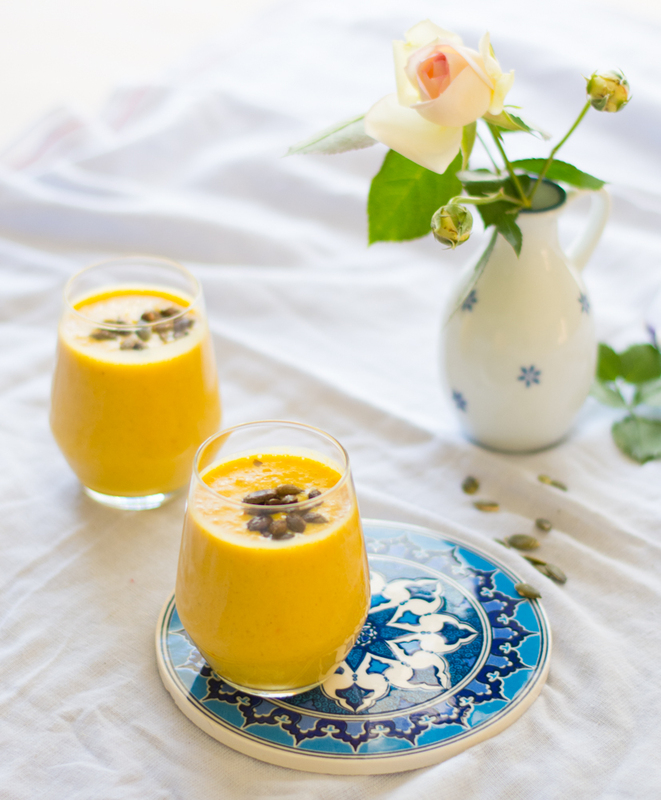 In Australia we are headed for a blazing hot summer and lassi is a much loved summer drink in our household for its cooling, filling properties. This is a sweet, but not over sweet version that combines honey roasted pumpkin with ginger and other spices. Finally, a sprinkle of toasted pepitas adds a surprising crunch. If you are feeling adventurous, you could even spike it with a little gin for a cheeky cocktail. Preheat the oven to 400 F. Cut the pumpkin into large pieces (no need to remove skin) and rub the cut surfaces with honey. I used about 2 tsp for this. Roast on an oven tray for 25-30 mins or until very soft. Scrape the pumpkin flesh out of its skin and place the flesh in the bowl of your food processor with the ginger, milk, yoghurt, cardamom, 1/2 tsp cinnamon powder, vanilla and about 1/4 cup honey or syrup. Blitz until well mixed and the ginger is shredded. If you think your food processor may not shred the ginger, finely grate it before adding it to the other ingredients. Taste and add more sweetener if desired, blitz again to mix. Place the lassi in the fridge to chill. Place the pepitas in a frypan and toast on low heat for 3-4 minutes or until slightly browned and popping. Transfer to a bowl and toss in a small amount of cinnamon. 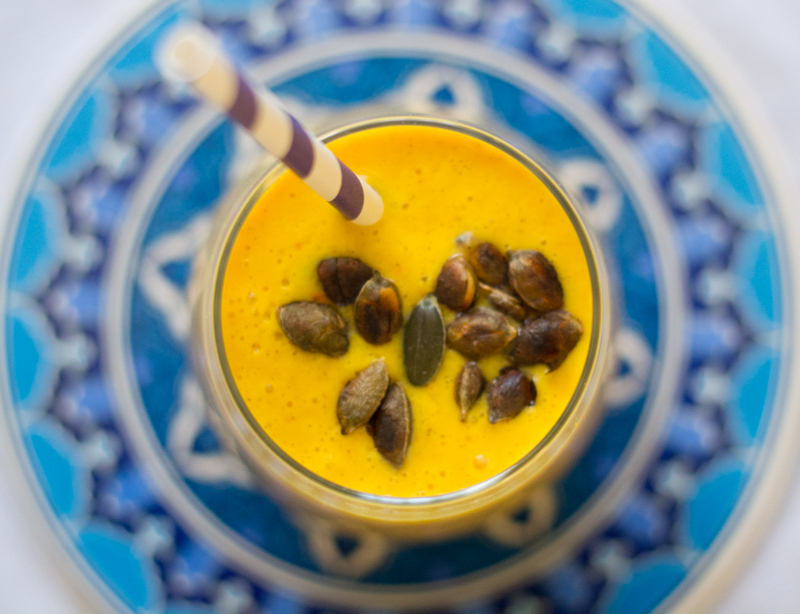 Serve the lassi chilled and sprinkled with the cinnamon tossed pepitas.